How much you wanna bet Len Hoyes patronized this joint. Strange, eclectic offering of services. 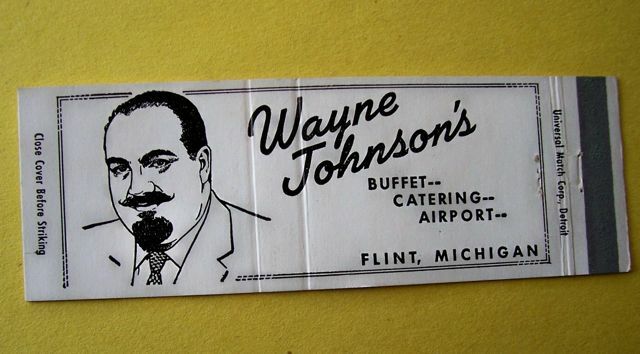 Did Wayne Johnson own an airport along with his restaurant and catering businesses? Did he own/run the bar restaurant at Bishop Airport? What does "Airport" mean here? Yes, your chicken Kiev is wonderful but I ordered the airport. Great to hear from you. If you feel like it, tell us about your grandfather. This has to be the greatest matchbook I've ever seen. I've had a few people tell me it would make a great t-shirt. Your grandfather seems like he had a lot of style! My Grandfather was VERY interesting man. The airport part of the matchbook referred to a restaurant that he had a the Bristol airport. Although I do not know any of his stories from first hand knowledge, the family has many scrapbooks of his adventures. His "complicated facial hair" was one of his trademarks. He was called "the man with the van dyke" and I have seen old newspaper clippings of a story of him going into a Flint barbershop and asking for "the works". When the barber shaved off part of his trademark facial hair, he had a fit and somehow found a way to gin up enough interest in the story to get it printed. There are many articles like that. 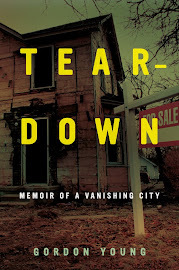 He loved to find ways to get his name in the paper and thereby promote his businesses. The thing that I remember the most about him was his curiosity and continued love of learning. When I was a little girl, I vividly remember his basement office just jammed packed with newspaper articles that he had found interesting, scraps of paper that he would write his ideas on and old pieces of restaurant equipment. One thing he had down there that always intrigued me was an old barber chair. I wonder if maybe he got it as restitution for the bad shave! He continued in the food service industry after leaving Flint because he truly had a passion for food. They just don't make men like that anymore. By the way, I love the idea of a t-shirt! Was the W.J. place at Price's Airport, a now-defunct (I think) private grass strip located west of Flint and several miles north of Bishop...? There may have been a small airport that this man owned, or he could have been referring to a limousine service to Bishop and Metro Airport. Many small airports have disappeared due to restrictions and regulations affecting private pilots and aircraft. The industry was decimated when such flying was prohibited for a time after 9-11. Private flying is considered by many to be an elitist hobby of the wealthy that should be restricted according to many politicians. Meigs Field on the Chicago lakeshore was literally destroyed a few years ago by backhoes cutting the runways up, literally in the middle of the night, on orders from former Mayor Daley. Bristol Airport..............is that Bishop now? He was at odds with the city or its politicians from time to time.I seem to remember when they insisted he wear a hair net on his chin and asked the health department to enforce it.I don't remember how it came out. Wayne Johnson is quickly becoming my hero. A hairnet on his chin!? That's outrageous. Can you put a saddle on a wild stallion? No! Bishop Airport is on Bristol Rd., which might be the source of the confusion. It has always been named Bishop Airport from anything I have heard. The best way for a child to learn about flying and aviation is from a parent who flies. It is better early on than later flying lessons and the military, because it allows the child to learn flying when his mind is young and nimble. What kid wouldn't find flying fascinating? That direct passing of knowledge from parent to child, provides a hobby and often a career in flying, That has to be the best way to learn early on, and the best argument for continuing to allow a private flying industry. These days, you have to think about opportunities like this to achieve the full employment that Flint and now every city needs. Don't let short sighted politicians ruin that opportunity.